No, this doesn’t have anything to with food or recipes but something’s been weighing on my mind so I want to talk about it. And maybe (just maybe? hopefully?) spark a conversation that might affect change. My son is a 9-year old baseball player. Watching him and his teammates play ball over the years has brought me more joy than I ever would have expected. We’re five years in and I still feel disappointed when practice is rained out. We play rec ball in the spring and travel ball in the fall (for now). Last year he made the all-star team (AA coach pitch) and my love for baseball was fully cemented. I don’t know what we ever did to deserve the stroke of luck that threw us together with the team we were on, but last summer marks the best season of my life as a parent. The boys won their sub-district championship, won their district championship and we went on to the state championship. "I don’t know what we ever did to deserve the stroke of luck that threw us together with the team we were on, but last summer marks the best season of my life as a parent." We (the kids, coaches, spouses, families, friends and everyone else who came along on our journey) had something special. We won and we won and we won some more and it was because the boys loved their coaches and they loved them back. Parents didn’t squabble or politic and no one expected special treatment. The day we got put out of State (finished 4th I think) I cried and cried like a big dumb baby because I just wasn’t ready for the magical experience to end. I tell you all that to give reference to the thing I want to talk about. My boy managed to make this year’s all-star team as well (AAA minors) and we’re super excited and proud. We begin tournament play in less than two weeks and I just about can’t contain my excitement! But there’s one thing gnawing at me. 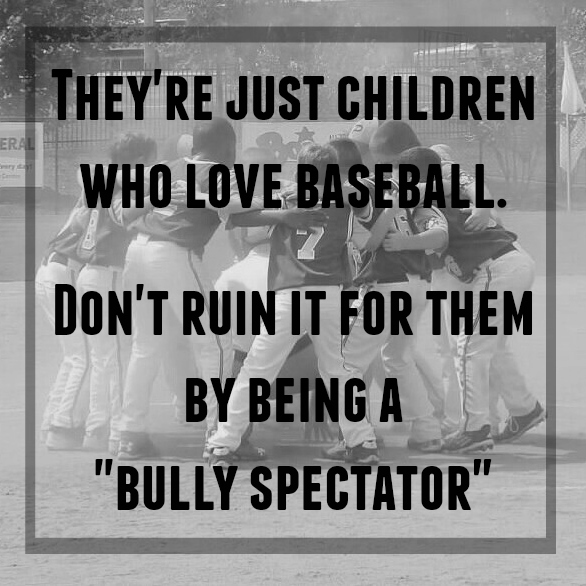 I am absolutely dreading encountering what I call the “bully spectators”. These are the fans (usually parents – scratch that – usually mothers) who heckle and harass the children on the opposing team. I’d never experienced it during rec ball at our home park so I was not prepared to watch mothers (mothers!) stand behind the backstop with plastic megaphones while a 7-year old is up to bat and SCREAM just as he is about to swing in hopes that he would miss the ball. I was not prepared to watch little boys startle and jump then look over to see someone who resembles the person they love most be the source of their torment. "I was not prepared to watch little boys startle and jump then look over to see someone who resembles the person they love most be the source of their torment." I was not prepared to see dads circle the fences of the outfield to yell things like, “I got it!” hoping to throw off two outfielders running toward the same ball. I was not prepared to watch adults gang up behind a child warming up to bat to tell him how terrible he is, how he’s a joke, how he can’t hit, how he shouldn’t even be here. Just to try to crush his spirit enough that he might not get a good hit. In the beginning I wondered (hoped?) the issue was unique to our district but soon found the same abhorrent behavior at the state tournament. Do you know what the age range is for AA coach pitch players? It’s 7-8 years old. Could you ever imagine bullying a 7 or 8 year old child like this? As a mother, it breaks my heart. Don’t get me wrong. I’m no softy. I’m a pretty hard-nosed mom. I don’t coddle my children and don’t expect anyone else to. If anything, I’m that mom other moms look at and think, “sheesh, she’s tough”. I should also point out that there’s nothing wrong with being LOUD and excited and cheering your face off to support your team. There’s not too many people louder than me. But there’s a difference in being loud and in being a bully. Just let the kids play ball. May the best team win - without interference from outside forces. Forces who should recognize, as parents, what they’re doing to innocent children. "there’s nothing wrong with being LOUD and excited and cheering your face off to support your team ... But there’s a difference in being loud and in being a bully." I think the youth baseball organizations do what they can to police this behavior. Tournament officials and umpires have the authority to ask spectators to stop but what’s true is the umpires can’t be focused on doing their job and wrangling ill-mannered spectators at the same time and there are only so many officials to go around. I’d like to see coaches and parents take more ownership of it and ask their fans to represent their team more honorably. So, that’s what I wanted to talk about. If the person sitting next to you starts being a “bully spectator” maybe think about having a soft word with them to remind them these are just children. If you know someone who behaves this way, maybe talk with them about it. I was reading over this and realized I missed a point. I have come to understand this bothers me for obvious reasons (the effect it has on the children, etc.) but I think the reason this haunts me so is my frustration of having no way to deal with it or change it. It is a feeling of complete impotence. I know how I want to handle it. I know how I would handle it on private property or out of the view of children. Maybe it’s my age or maybe it’s how and where I grew up but the way I’d like to handle it is to drag that heifer to the woods and show her just exactly how I feel about her and her megaphone. That’s how we handled things where I come from. But I can’t do that. I would never traumatize my or any other children by making them bear witness to adults fighting (verbally or physically). So I’m filled with this impotent rage that I have no escape from. There’s nothing I can do. Nothing. I have to just sit there and endure it. And watch these children who I love endure it. I’ve thought about approaching these bullies and respectfully asking them to please stop. But people like that wouldn’t react to a sincere request the way most of us would. They would jack their jaws and bob their heads and point their fingers and yell and curse and, though I hope I’d be able to walk away from it for the sake of the children, I have my limits. And I’m pretty sure watching mama get carted off by the county police would be 10X worse on my boy than anything the bullies could have thrown his way. I agree wholeheartedly. My 10-year-old plays softball. At a tournament this weekend, a mother from the other team didn't like the umpires call. She was swearing up a storm at him through the fence (while he was standing next to the 10-year-old batter and catcher), threw her chair and went to "tell on him" to the organizers. Really? If I were your daughter, I'd be thoroughly embarrassed...unless the kid sees that as the appropriate way to act as well because that's how she's being raised. Honestly, there is no place for that ESPECIALLY at a 10-year-olds game. The winning team will NOT be getting college scholarships so back off! Thank you for a beautifully written essay on poor sportsmanship. I will tell you that it won't get any better as your kids get older. Also, I will tell you that it isn't just a baseball issue...we experienced it with our daughters' softball, our son's football, and also with soccer. I sometimes wonder if these parents who perpetrate this type of behavior could somehow stand outside themselves and see it objectively, would they continue acting so foolishly? Sadly, I think the answer is probably yes. We've often said that it's usually a case of the parents living out their own unfulfilled dreams as child athletes, but it makes me sad too. Good for you, Mandy, to try and put a face on it...I hope it helps. Parents who act this way at sporting events probably act this way in other areas of their life when things don't go as they wish. Maybe that's the cause of the condition of our great country today. These parents are not only setting a bad example for their children but their words and actions can be very humiliating to their child. We encountered this with our sons with football. I was appalled and actually walked out on the field and asked everyone to remember that these were 8 year olds only out there to have fun and learn the game. We wonder why there is so much ugliness in the world. I think that at times like this we should be the example - hold your hat - but winning is not everything when you are developing the love of the game with children..Good for you for being the adult and fostering the right behavior. I totally agree with your sentiments! My son played soccer and ice hockey in high school- I dearly loved to watch the practices and games - and cheered until I was hoarse. We played at both the rec level and travel team levels. I would get * mildly irritated* with parents who tried to coach or referee from the sidelines or bully the players on either team. My husband sometimes had to steer me away from particularly obnoxious parents so that I wouldn't made a rude comment to those parents. I suppose they didn't care about what example they were setting for their own children. Lets face it - some parents aren't adult enough to have children! I have never heard anything like that before, my daughter played ball for years and I've never seen anything like that, not that I think everything that happen while she played ball was ethical, but I've never seen anything like that, and she's still playing ball as an adult, and I hope I never do. Sports is no longer honorable at any level. It is rampant with gambling, cheating, and drug enhancement. There are no role models for young children and while it is true that participation should be fun for the players and spectators, one only has to look at professional teams and the Olympic contenders to see that it is all no longer a fun diversion but a orchestrated fiasco. And we wonder why there is schoolyard and internet bullying. Or for that matter bullying of any kind - any where. Children learn by example.Parents/Adults need to be better role models w/words and behavior. My boys are 2 and 3 so we're not doing extra-curriculars just yet. I knew, having kids, that a day will come when they'd be the odd man out, the one being picked on, the one not as good as others in some way, etc. But I expect that to come from other kids. The thought of that kind of treatment coming from an adult is mind boggling. And heartbreaking. I think I'd feel just as impotent as you. I have no advice. But I stand with you in solidarity. It's stupid! It's Little League - not the Olympics!! I don't know in which state you live, but I seriously thought this kind of behavior, from parents no less, was not acceptable and would not be tolerated by Little League associations, coaches, etc. Any parent who exhibits this type of behavior should be asked to leave or stop with the abuse. And frankly, if they don't or can't act like a reasonable adult, their child should not be allowed to play ball. As you said, these are children playing a game. I certainly would not tolerate ANY SOB (male or female) doing this type of foolishness to my child or any other child, period. These people must be crazy. Perhaps they should take out all their hate and aggression at the gym or the psychiatrist's office, but leave little kids alone. Many different leagues are setting up guidelines, requiring parents and coaches to attend workshops on appropriate behavior. This workshop must be completed before an athlete is allowed to participate in practice or games. If there are violations, after a warning, the parent or coach is asked to leave. It's sad that these precautions have been put into place, but it does help alleviate the bullying and bad manners. My philosophy as a physical education and classroom teacher was to only encourage, never disparage. And as a parent/coach, never, ever, shout correction during a game (i.e. "Keep your head down!" etc.). Those types of corrections should be addressed by the coach in a one-on-one, not by a parent screaming from the bleachers. Good luck on your son's season. I'm sorry you're having to deal with such bad behavior. My children are adults now so it has been a long time since I attended children's sporting events. Last year I was invited to watch a friend's preteen son's baseball game. I could not believe the behavior of some of the moms. I was embarrassed for the women and even more appalled that the siblings of the players followed in their mothers' behaviors. I wanted to leave the game because it made me feel very awkward. I didn't know if this was common or accepted behavior. I decided to not attend anymore games because of this. I don't know how I would cope if I had to regularly attend such events. I don't have a thick skin and I am overly protective of my children. My in-laws used to take tin plates to their children's soccer games and when the other team had a penalty shot, they would rattle the pans. I told them how disgusted I was with that and they looked at me like I had 2 heads. Get the other parents together and talk to the coaches WITHOUT the kids around. Ask them to go to the people that run the league and start rules. If the rules are not obeyed - they get tossed out. That way you won't be the bad guy. This is disgusting and the children should enjoy it because it is only a game. Makes you sad, doesn't it that our world is turning out this way. I agree with one of the comments above. Have a meeting (without the children) to address this issue. It needs to be stopped. I assume that parents have to pay a fee to have your children play? Have every parent pay a little extra and hire 'bouncers'... OMGosh, I can not believe that I am even thinking of 'bouncers' at a sports game. Have it announced before every game, that if anything derogatory is yelled at the game, you will be asked to leave and have the 'bouncers' float around the crowd to listen for this type of behavior. Here's what you do: If the other parents agree with you then as a UNITED FRONT, you can do something about it. 2 are better than one, so AS A GROUP, the parents can put a stop to the foolishness and enjoy the games. Get together and discuss solutions to the hecklers and the overly competitive moms who don't hear how bad they sound. Even better, get the men to do it. If the husbands and fathers get on the same page, they can shut it down. Some people even post "NO HECKLING, LET'S DO IT FOR THE KIDS AND ENJOY THE GAME" signs around the park or facility once they get permission. Another team on the North side has a private duty security guard who volunteers to go to the games and just walks around in uniform. That shuts it up really quick. You're never powerless until you feel like you are. Hold your head up. Foolishness can only last for so long. My son played many sports and it seems there is always a person or group who feels the need to behave this way. It's heartbreaking for the kids. The worst I witnessed was at my nephew's baseball game where a coach belittled and berated a volunteer umpire who was about 17. The poor kid was scared to death and afraid of what the coach might do to him after the game because the team ended up losing. Nobody should have to feel that way because of a baseball game. I really think it's gotten worse as little league sports are more competitive. Good luck for the rest of the season and try to have fun! Video the bully. Hand them a pre-printed business size card that says something like, "If you don't stop I will post this video on you tube so everyone can see what an a$$ you are." Talk to your park board and offer to post the sign you have shown above around the park. It's a start. Don't you pay for your child to participate on sports teams? So, demand quality. As a group of parents, meet with league executives to present your case and work collaboratively on a code of conduct that applies to all players, officials, and spectators. Clearly outline consequences. For example, if a spectator is harassing a player on the other team, in violation of the code of conduct, the game is forfeited to the other team. Who decides what is harassment or offensive behaviour? Who makes the call? Who enforces? Is there an escalating scale of consequences? You'll have to figure out those details as a group. Is it tough? Yes. Necessary? Yes. Will it work? With commitment. My youngest is now 38 and this type of behavior is nothing new. Sometimes its the kids who find a way to resolve the issue. Once when there was an abusive father screaming at the opposing team's pitcher that he was a loser both teams stopped playing and began to yell "You're the loser! You're the loser! An old guy picking on a kid. Loser, Loser, Loser!" Rather than scream down two teams of 9 year olds he left the field. Everyone was left silent until the ump yelled "Play Ball." Maybe coaches need to teach the kids how to respond to attacks like this. Makes me sad to think that even 30 years after this incident it seems nothing has changed. LSGourmet, while that particular problem was solved, teaching children to retaliate to poor sportsmanship is counterproductive. There's got to be a better way. I agree with you! The world these days is full of bully. Not only in baseball but anywhere even on internet. Many childrens have to stop go to school or face with depression due to it. I think we have to do something, to save our child from it. Yes, I agree with David Nolen, there are a lot of bully in the world today. But I think that instead of doing something to save our children, lets teach them, guide them to know how to save themselves, as we can not stay with them all the time. Just as bad, if not worse, are the parents who constantly yell at their own children, putting so much pressure on these young people that they never enjoy the game again. There is a solution. My nephew used to ref the games and even as a teenager, he gave one warning before ejecting the offender from the field. Worked pretty well. That is awesome!!! Way to go. I just got my big megaphone and yelled at the parent their exact words so they got a taste of exactly what they were yelling at my kid!! lol.. that didn't go well....but they stopped yelling at my kid. I agree with you! Baseball is special sport. Baseball is not popular sport. Of course, soccer is popular sport. Baseball is good sport. It is so good to train health, good stragery, team work. The mom like you can show the right way to follow and build a better future of any child.The baseballplayer has something good those are not available in the other boys.The pro custom writing review about the previous activities of the environment where all the moms can get involved.The youth baseball torunament should be organized regularly so that more young generation will grow for the future at National and international level. I just started reading your blog (which I love, BTW!!) so I'm commenting awfully late on this topic, but I felt the need to add my 2 cents. I live in Illinois, and both my kids have played rec and travel softball and baseball for a number of years. Maybe we are just lucky, but I've never witnessed this type of behavior!! I've seen parents and coaches argue or complain about umpires' calls, but have yet to see someone heckle another team's player or do something like yell into a megaphone to disrupt a batter! That is really low and completely uncalled for, and I'm very surprised that any umpire would allow such poor behavior. It's sad to see how rude and disrespectful today's youth have become (I teach, so I see this frequently!) but with parents like you've described, it's no wonder, bc the kids just emulate their parents' behavior. It will be up to people such as yourself though to unite with other parents of the same opinion, and together you'll have to try and make change. If this is happening during your rec ball season, I'd contact the park district officials to address the issue and like someone said above, try to collaborate to set up a code of conduct for both the athletes and the parents. There is usually some type of governing board for each league and your park district should know who those people are. As for travel, my first step would be to talk to your coach. It's entirely possible that they are so focused on the game that they don't realize what's going on in the stands (my husband is a head coach and he's told me as such). My husband and his coaches do not allow such behavior and have all parents sign a code of conduct at the beginning of each year, which also state that there are repercussions for their child if they don't follow the rules. I hope that you have success in eliminating this type of garbage if only on your own team. There's no reason for such behavior, and parents who exhibit it need to be called out. I think that is the coach's job though, not yours, so no one takes it out on your son (which if they're the bad sports you say they are, I'm quite certain they wouldn't be above taking it out on your child as well). Good luck! Hi Mandy! I don't know you or follow you... I just stumbled onto this blog post while doing research for a paper I'm writing on social movements in America. I highly suspect you are a lady living in the southern USA, as do I, where sports bullying is absolutely ridiculous!! I three grown children who we encouraged to participate in sports and social events at our public school. The kids endured bullying in every setting! Sometimes it is the parents. Most of the time it is their peers. Their peers learn directly from their angry, hateful, misguided parents how to carry on the family nature of bullying. Children watch and learn and it is a shame that our culture is so out of control that we are talking about it in a blog forum. We should be talking about how much fun our kids are having as they participate (in whatever they are doing!) and how they are making new friends, how parents are coming together to enjoy their common lifestyle at the ball park, etc. Our culture is so individualistic today. It makes me so very sad, and angry! I met a teenaged young man recently who is a super-jock. He was talking to a mixed group of adults and teens when he stated the name of a peer on the baseball team who they need to "sit on the bench" because he's no good and should just go to the house. .... He went on to indicate he believes the below-average player is the reason they are on a losing streak. Our culture has come to believe it's all about WINNING. That shouldn't be the primary focus when it comes to teaching our kids sportsmanship. .... I respectfully said to this young man, "Hey now, don't go beating up the nerds who wish they had your talent! We can't all be super-jocks!"... to which the crowd laughed off the entire conversation. I began to observe that particular family. They are great members of our community and I enjoy their company, but I noticed that sometimes the hyper-focus is on their personal ego and winning the game and being labeled the star of the game... and the parents are the source of this hyped-up egotistical attitude. Parents don't want their kid to be part of a crowd. They want them to be the superstar of the crowd. The struggle for "top dog" is the issue. It makes me ill and I hate going to my grandchildren's sporting events because the parents are exact replicas of everything you described in your original blog. I am shaking my head. Where will it stop? WILL it ever stop?